Our free Adobe Photoshop Tutorials and videos have been separated into 6 collections: Photoshop Tutorials for CS6, CS5, CS4, CS3, CS2, and CS1. If you own an earlier version of Photoshop, the tutorials for later versions will include features you might not have. In this episode of Adobe Creative Cloud TV, Terry White shows you how to get started with Adobe Photoshop CC and covers the 10 things that beginners want to know how to do. If you're new to Photoshop, this is the video you've been looking for! Jennifer Apple's free Adobe Photoshop tutorials deal with web and blog design, photo and text effects, and Adobe Photoshop tips and tricks for beginners. Create tiny custom icons using Photoshop. Photoshop tips (resources and templates) to improve your blog templates. This simple Photoshop trick will eliminate the blur often found after resizing. Use Adobe Photoshop to turn a photo into a sketch for a coloring book. How to edit and create sets of keyboard shortcuts in Photoshop CS and CS2. 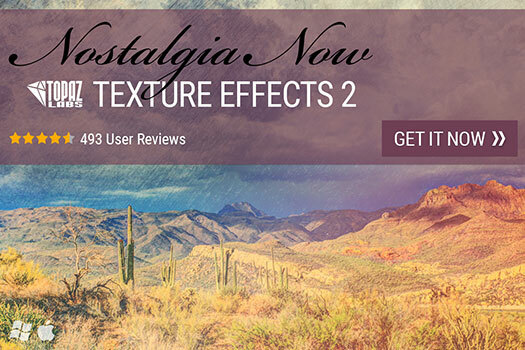 Topaz Labs is excited to announce the release of Texture Effects 2, with a new image processing engine that uses extensive GPU, 90 new textures, over 400 effects, new workflow features, and an improved user interface, Texture Effects 2 is better than ever. And if that isn't enough to excite every creative bone in your body, you can get $10 off Texture Effects 2 with special promo code TFX2 until October 30, 2016. Amazing Pro Nik Photoshop Plugins - 100% Off - 100% Free! I've been meaning to tell you about this super deal, finally a real one - how about an amazing package of pro plugins for free? Thanks to Google, it's happening right now. Starting immediately, the latest Nik Collection will be freely available to download: Analog Efex Pro, Color Efex Pro, Silver Efex Pro, Viveza, HDR Efex Pro, Sharpener Pro and Dfine. Easily create the photos you’ve imagined with six powerful plug-ins for Photoshop, Lightroom, or Aperture with the Nik Collection. Use U Point technology to selectively edit just the parts of your photos that need touching up without losing time on complex masks and selections. Our Photoshop Brushes Page has links to all kinds of amazing Photoshop brush sites, all handpicked by Jennifer Apple. We also offer some great free sets from Janita of Seishido and Kirsty of 500ml Brushes  including a very popular Valentine Brush Set filled with hearts and romantic gestures. Also see our Free High Resolution Photoshop Brushes Directory, where you'll find an amazing collection of high-res free Photoshop brush sets, and we've collected some of Stephanie's original brushes on a special Obsidian Dawn Photoshop Brushes Page, with big preview images for each set. You'll also find her great random tips for using Photoshop Brushes. Find links to great free Adobe Photoshop Actions on our Photoshop Actions Page. Also look for free tutorials and free actions from Gavin Phillips. The Toning With Duotones, Tritones And Quadtones tutorial will teach you how to create duotones, tritones and quadtones inside of Photoshop. At the end of the tutorial you'll find a link to 8 custom duotone/tritones as a complimentary download. Gavin has also kindly written up a nice Photoshop Actions Tutorial that will give you a quick course on Photoshop Actions. That tutorial ends with 3 free Photoshop Actions that produce beautiful photographic effects. Photoshop Lightroom has had somewhat of an identity crisis amongst the general population of photographers since its release in early 2007. The Adobe engineers built it to fill a gap in the Photoshop family of products (Photoshop CS3 and Photoshop Elements being the other two family members) but many amongst the photographic community have not been able to identify its primary task to make it the ‘must have’ product that Adobe hoped it would become for all digital photographers. Read Adobe Photoshop Lightroom - Who Needs It? Make sure to see our latest Photoshop CS5 tutorials and Photoshop CS5 video tutorials. Are you a student or teacher? Get up to 80% off at the Adobe Education Store. The Auto Alignment, Lens Correction, Remove Ghosting and expanded controls for rebuilding detail and contrast are now so good it will firmly establish Photoshop CS5 as the software of choice for photographers interested in HDR Photography. Russell Brown, Photoshop senior creative director, presents his favorites from over 100 new features, including Content-Aware Fill, Puppet Warp, HDR Pro, realistic paint brushes, and new selections tools for the trickiest elements like hair. We are very proud to be hosting these amazing tutorials from Photoshop expert Mark Galer. An internationally acclaimed author and teacher, Mark's Photoshop tutorials are comprehensive, yet easy to follow, and will bring your skills to a professional level. Getting tired of pin-sharp, noise-free, character-free images from your 24 Megapixel Pro DSLR? Then try this grunge effect to give your images the toy camera aesthetic - think WEIRD – think GRUNGE, think ART! The treatment outlined in this tutorial is also available as an automated Photoshop action that can be downloaded from www.markgaler.com. 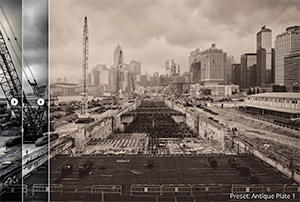 Read the full How To Create A Holga Effect In Photoshop Tutorial. In this tutorial Mark Galer demonstrates how to give your photographs a ‘tonal mapping’ or ‘Faux HDR’ treatment to create a signature style. Mark Galer shows you how to boost detail by pushing some adjustments in Photoshop Elements 9 to the max. The best sharpening techniques are those that prioritize the important areas for sharpening and leave the smoother areas of the image well alone, e.g. sharpening the eyes of a portrait but avoiding the skin texture. These advanced techniques are essential when sharpening images that have been scanned from film or have excessive noise, neither of which needs accentuating by the Unsharp Mask. So let the project begin. Your number one essential step for success is to first shoot your model against a white backdrop, sufficiently illuminated so that it is captured as white rather than gray. The post-production is the easy bit - simply apply the correct sequence of editing steps and the magic is all yours. This is not brain surgery  but follow these simple steps and you will join the elite ranks of Photoshop gurus around the world. Celebrity status is just a few clicks away. • Ink Outlines  How To Give An Image A Drawn Look. You can find the latest news for Photoshop CS4 on our new Adobe Photoshop CS4 Resource Center, plus links to free Photoshop CS4 tutorials, Photoshop CS4 video tutorials, and CS4 tips and tricks. 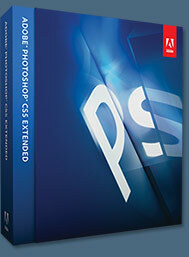 Want to read about new features in Photoshop CS4? 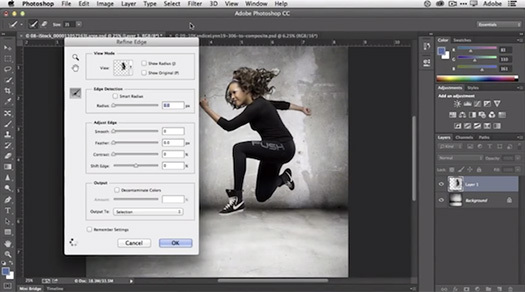 See our Adobe Photoshop CS4 New Features Walk Through by Photoshop expert Philip Andrews. It highlights all the new Photoshop CS4 features. Also see our new Free Photoshop CS4 Training Page. For Photoshop CS3 tutorials see our Photoshop CS3 Tutorials Page. Photoshop CS3 Extended includes all of the features in Photoshop CS3 plus specialized features for editing 3D and motion-based content and for performing image analysis. The Mac version of the download is 759.57 MB, the Windows version is 463.59 MB. For more info on Photoshop CS3 see our Photoshop CS3 Resource Center, which has the latest Photoshop CS3 news, Photoshop CS3 articles and Photoshop CS3 reviews. You can find the latest news for Dreamweaver CS4 on our new Adobe Dreamweaver CS4 Resource Center. There's not much yet, but as soon as Dreamweaver CS4 is released we'll have the news for you. In the meantime, there are some Dreamweaver CS4 Beta video tutorials. And as soon as they are available, we'll have links to free Dreamweaver CS4 tutorials, CS4 video tutorials, CS4 tips and tricks. Go to our new Adobe Illustrator Resource Center Page to find the latest news for Adobe Illustrator CS4. There's not much yet, but Fireworks CS4 Beta has been released. In the meantime, look for the latest Illustrator CS4 news articles. Go to our new Adobe Acrobat Pro 9 CS4 Resource Center Page to find the latest news for Adobe Acrobat Pro CS4. You'll also find links to free Acrobat Pro CS4 tutorials, Acrobat Pro CS4 video tutorials, Acrobat Pro CS4 tips and tricks. Our friends at Vertus, the makers of Fluid Mask 3 Photoshop Plugin, have set up a special exclusive discount for PhotoshopSupport.com. Buy now for only $129. Just follow this discount link and instantly get $20 off your purchase of Fluid Mask 3. We're very proud to be hosting these great tutorials by Ivan Raszl of CreativeBits. His tutorials include how to remove red eye from photographs, how to make diamond plated brushed metal, how to create brushed aluminum, how to create water drops, how to turn photos from color to black and white, how to create seamless tiles in Photoshop, how to place artwork on uneven surfaces to make waving flags, and the very popular series Photoshop Tips & Tricks Volume 1, 2 3, 4, 5, and 6. Our new Photo Recovery Resource Center will point you to resources for immediate digital photo recovery. These are expert solutions that we strongly recommend in the case of catastrophic events like a total hard drive crash or a corrupted media card. You'll find information on DriveSavers, an acclaimed company that specializes in safe and complete hard drive recovery, and information on PhotoRescue, which is currently the most popular and successful digital photo software available for photo recovery, and which includes the ability to undelete invisible files. We've created a new section  Photoshop Elements Resource Center  with Free Photoshop Elements Tutorials, and the Latest Photoshop Elements Books. Also added a collection of free Adobe Photoshop Elements 3 video tutorials courtesy of Total Training. This special section offers you digital photography news, articles, books, and a special camera raw section. Get all the latest news and information on Apple's Aperture digital photography software at our new Aperture Resource Center. This directory will list all the latest Aperture tutorials and Aperture reviews as they become available. Our Free Fonts Directory offers a comprehensive list of free font resources. Our Free Stock Photos Directory offers a comprehensive list of free stock photo resources. Stock Photo Agency Directory - list of fee-based royalty free stock photo agencies. Find information and links to a wide variety of commercial plugins, brushes and actions, as well as free plugins, free brushes, and free plug-in resource sites. You'll also find links to monitor calibration solutions. All of Wacom's tablets are pressure sensitive - they literally feel the full range of pressure from the pen on the tablet. See our Wacom Tablets page for more information. Our Photoshop Resources Center has links to Adobe's online Photoshop resources, online and video-based Photoshop training programs, great Photoshop forums, and the best Photoshop books, Photoshop magazines and design magazines. You'll also find links to stock photo websites, photography resources, and other interesting Photoshop sites. We've been adding to our Inspiration Section. You'll find exclusive photos from Face Of Tomorrow, the beautiful and mysterious photos of Marshall Sokoloff, some mesmerizing photos from Jeff T. Alu that use dodge and burn techniques, the work of technical illustration master Kevin Hulsey, selections from FILE Magazine, an amazing piece of Photoshop work by James Porto, some extraordinary celestial art from Greg Martin, some magical underwater encounters from Catherine Salisbury, and a stunning piece of photo-realism from Photoshop Guru Bert Monroy. James Porto "New York Magazine Cover"
In our Stock Photos section you'll find a comprehensive list of fee-based stock photo agencies. Learn more about PhotoshopSupport.com and about Futura Studios on the Contact Page. You'll also find a feedback form you can use to send us a message. All searches are now powered by Google. On our Advanced Search page you can read tips on how to improve your results when searching the site. Use our Site Map to locate a specific page or section of the website. PHOTO CREDIT: Tracing & blending of NASA photos, + PS-generated stars & comet.